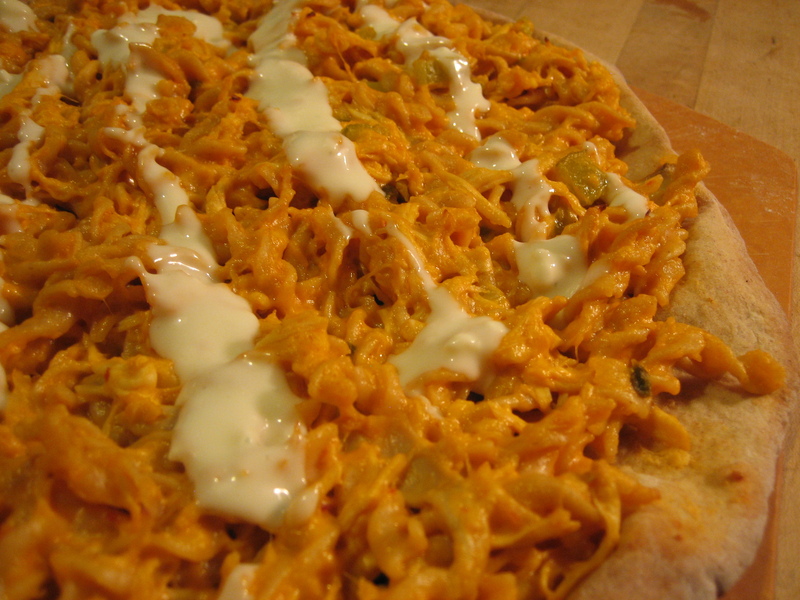 Buffalo Chicken Pizza and Macaroni and Cheese Pizza are two of my most popular pizzas. What could be better? Taking two great ideas and putting them together to create Buffalo Chicken Macaroni and Cheese Pizza. This was a fun pizza to make and to eat. The flavors from the cheese and the Buffalo chicken were distinct, but when combined tasted outstanding. Here’s how I did it. in a pan with sautéed onions and celery. Then, I combined the two in the mac and cheese pot and left it on low heat. I spread the mixture on the pre-baked dough and let it bake for eight minutes on 450. Before serving, I drizzled Marzetti Light Chunky Blue Cheese Dressing on top of the pizza. This entry was posted in blue cheese, Buffalo wing sauce, celery, cheddar cheese, cheese, chicken, Meal->Pizza, meat, Onion, Pepper Jack, pizza, sauce, veggie and tagged Buffalo Chicken, cheese, mac and cheese, pizza. Bookmark the permalink.